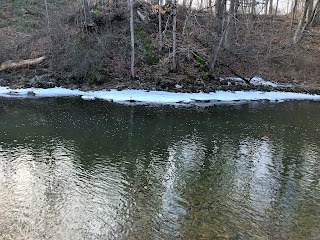 We managed to get out yesterday and fish the South Branch of the Raritan River for the first time in 2018. 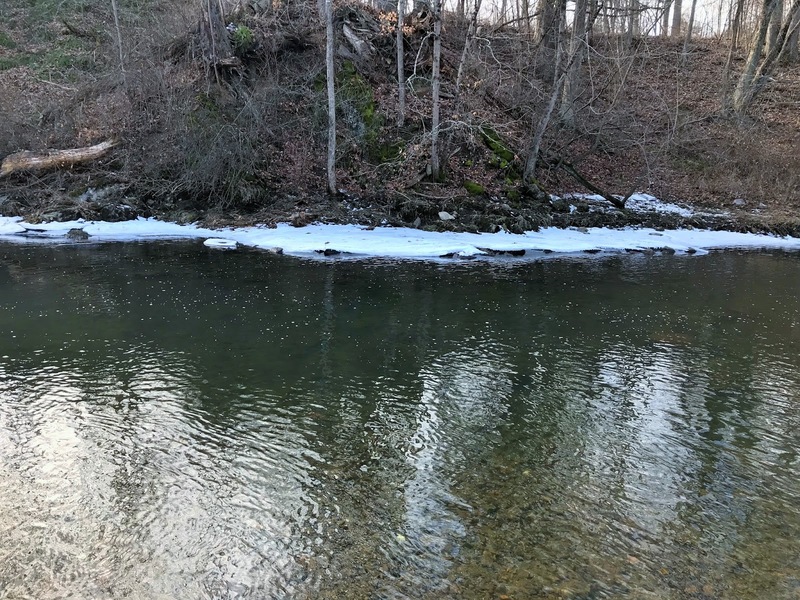 Up until last weekend when we had high water from heavy rains, the river was encased in ice and pretty much unfishable. When I got to the water yesterday in the early afternoon, the air temperature was nearly 50 degrees F and the low winter sun fought its way through high thin clouds casting its dull winter light across the land. The water was a mere 36 degrees F.
When the conditions are such as they were yesterday, I keep it real simple. I tied a size #6 beadhead krystal bugger to the 4X tippet I first added to the 9-foot leader. I cast the fly across the river leaving it just short of the bank (or the ice) and then brought it back in short, quick strips. After missing several short strikes, I hooked and landed a nice 14-15 inch brown that was in my net only for the few seconds it takes to back a barbless hook out and then dip fish back into the current to swim away. I also took a 10 inch rainbow that fought like it was twice its size, and then called it day as my feet were protesting the cold water relentlessly. There were lots of guys on the river in just about every good run. This spot, the easiest to access, was empty so I stepped with my "leather briefcase".